Ministry of education has released shs 36B to cater for Free Primary and Free Day Secondary Education programmes in public education institutions. According to the Ministry’s Basic Education Principal Secretary, Dr. Belio Kipsang, details of close to 300,000 students have not been uploaded on NEMIS and hence will miss the Free Secondary Education, FSE, funds. Speaking after inspecting the effectiveness of the delivery of the Competence Based Curriculum at Ngong Township School, Kipsang explained that Sh30 billion the ministry had disbursed will only cater for 2.6 million students whose details had been captured on National Education Management Information System (NEMIS). He said the ministry had not send capitation to 3,000 students, noting schools had not uploaded their details on NEMIS, an online data capture and retrieval system. “We shall not disburse any capitation to students whose details have not been put on NEMIS,” said Dr Belio Kipsang. Kipsang further said the 100 percent transition has been achieved on paper and schools are still updating details onto NEMIS. “What is happening is that schools are still registering students on NEMIS even though the students are already in school,” noted Dr Kipsang. Funds for free secondary education is usually disbursed in three phases. The first phase involves 50 per cent of the cash, in the first term based on the population of learners in each school. The second phase of the disbursement which is makes up 30 percent of the total budget allocation is released in second term which begins in May. The final chunk, which is 20 per cent of the total funding, is made available during the third term which begins in September. 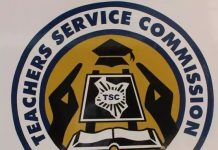 At the same time, Teachers Service Commission,TSC, has announced that they will employ more teachers to take care of the increased workload from the 2019 form one admissions. The TSC Chief Executive Officer, Dr Nancy Njeri Macharia, says 5000 secondary school teachers will be employed this month in line with 100 per cent transition policy.